The day has dawned for the greatest event in athletic history – the Olympic Games! But some terrible ter-moo-nators want to sabotage the event, and destroy cow history in the process. And when they kidnap Little Bo Vine and her brother Pat, whisking them back to Ancient Greece, it’s up to Professor McMoo to save his friends – and stop the ter-moo-nators in their tracks. Posing as gods, the evil ter-moo-nators are plotting to win every event at the games, and then take over the entire world! 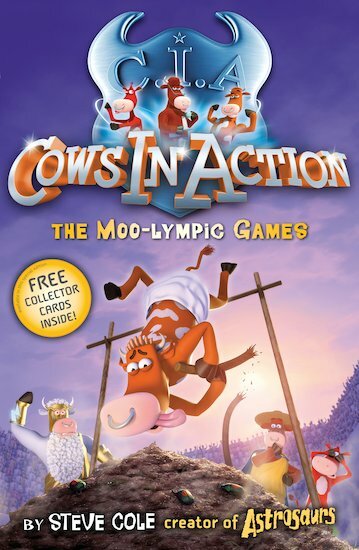 Now it’s up to our brave bovine heroes to defeat Moos and his team of well-trained Oxon – and claim Moo-lympic gold! 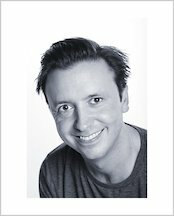 Steve Cole is the slightly crazy, highly frantic, millions-selling, non-stop author of Astrosaurs, Cows In Action, Astrosaurs Academy, The Slime Squad, Z. Rex and many other books (including several original Doctor Who stories). He used to edit magazines and books but prefers the job of a writer where you can wear pyjamas and eat chocolate all day. Steve just can’t stop writing – if he does, strange robots appear and jostle him vigorously until he starts again. In his spare time he loves making music, reading old comics, thinking up ideas for new books and slumping in front of a warm TV.